Mike has over 10 years in the arboricultural sector, with all of that being involved in tree surgery. We are dedicated to providing a comprehensive and professional advisory service. We also carry out tree surgery and soil de-compaction. TD Tree and Land Services Ltd are qualified tree surgeons, providing tree surgery, ecological and landscaping services, for domestic and commercial clients in Edinburgh and throughout Central & Southern Scotland and Northumberland. Domestic Our expert tree surgeons carry out domestic tree surgery services including; pruning, felling, and tree stump removal as well as professional tree reports & surveys. TD Tree & Land Services Ltd are fully qualified and insured to take on all aspects of tree and landscaping work. We provide a friendly and affordable service and ensure all tree surgery work is completed safely and to your satisfaction. If you require a professional tree surgeon in Edinburgh, Southern & Central Scotland and Northumberland, contact us today for a FREE NO OBLIGATION QUOTE. 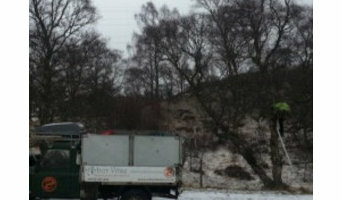 Commercial With three bases in Scotland at Dunblane, Edinburgh, and Duns in the Scottish Borders, TD Tree & Land Services Ltd offer a complete tree surgery, ecological and landscaping service to the commercial sector throughout Edinburgh, Southern & Central Scotland and Northumberland. Our Commercial tree and landscaping services include: site clearance (including pesticide spraying), grounds maintenance, landscaping, arboricultural consultancy and woodfuel (woodchip and firewood) as well as forest, veteran tree and woodland management. In addition, we provide a 24 HOUR EMERGENCY CALL OUT SERVICE. En arborist jobbar med trädvård, helt enkelt. Det kan vara allt från trädklippning (till exempel klippa äppelträd), trädplantering, och att såga ner träd till stubbfräsning. Yrkestiteln arborist kommer från latin, där ordet arbor betyder just träd. Även trädvårdare jobbar med vård av träd, och titeln beror helt enkelt på kompetensnivå. Lycka till med att anlita en arborist eller annan person kunnig inom trädservice i Heriot, Scottish Borders, UK. Vi hoppas att allt går vägen, oavsett om du ska beskära en ek, lönn, tall, plommonträd, lind, pilträd, ett kastanjeträd eller vilket annat träd som helst.